cardigans and kids: Saturday mornings - blue ribbon coffee cake. Saturday mornings - blue ribbon coffee cake. 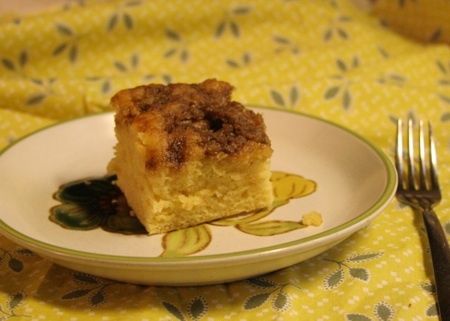 A while back when we had friends stay over, I baked a coffee cake for breakfast. That same day was when we were entering our food and items for open class in our county fair. I had a few extra pieces, so I decided last minute to enter it as well. The coffee caked ended up with a blue ribbon, so I think it is worth sharing. Especially since it comes together quickly, and reheated each morning, afternoon, coffee or tea break - will last for several days. 1. Preheat the oven to 350 F. Grease a 9x13 pan. 2. In a large bowl (or stand up mixer), mix the wet ingredients together. Stir in the sugar. 3. In a medium sized bowl, whisk the flour, baking powder and salt together. Pour into the wet ingredients. Mix together until smooth. 4. Make the topping. In a small bowl, mix all ingredients together until crumbly. 5. Pour into the prepared pan. Sprinkle the topping on and bake for 45 - 48 minutes. This looks ever so delicious! I have been in such a baking mood lately. This, of course, will get 'worse' as Winter will be arriving soon. The best reason to fill the house with loveliness! Thank you for sharing!